Buildup. Pomp. Circumstance. A-Listers ringside. A collision of the games greatest calls for it all. Tonight, another clash in the desert between boxing’s two biggest names outside of the heavyweight division will finally bring the sports most anticipated rematch to HBO Pay-Per-View. What can you expect to get for your eighty-five dollars? Let’s break it down. Gennady Gennadyevich Golovkin AKA “GGG” or “Triple G” and “Big Drama Show” for his stunning finishes. The Kazakhstan native stands at just below six feet tall, with a reach of 70 inches. Boasting a career record of 38-0-1 (34 KO), Golovkin is the most feared puncher on the planet. Of his thirty-four knockout victories, twenty-three were consecutive, and he is the proud owner of the highest victory by knockout percentage in the history of the middleweight division with 87.2 percent. As his record makes clear, Golovkin relies on his power to close the show, and prefers to be on the offensive, punching his opponents into trouble at any moment. He has never been knocked down at the amateur or professional level. At 36-years old, the current unified middleweight champion is as big a threat as ever, coming off of a violent second round knockout victory over Vanes Matirosyan, who served as a replacement for Canelo in a would-have-been rematch in May, which was canceled over a failed drug test that pushed this fight to September. Nicknamed Canelo, or cinnamon in Spanish for his red hair, the Mexican enters this bout at 49-1-2 (34 KO), with his lone defeat coming at the hands of undefeated world champion Floyd Mayweather Jr. back in 2013. Despite Golovkin holding the titles they are contesting, BoxRec ranks him as the current top pound-for-pound fighter in the world. Canelo’s last bout was the first match against Golovkin, as he has been suspended for much of the ’18 calendar. Canelo is a boxing prodigy who lived up to his hype. A technical perfectionist, his offense is predicated on his amazing ability to counter punch. Claiming his failed drug test was the result of consuming too much tainted Mexican beef, Alvarez has many critics to silence following the many delays leading to their first unsatisfying bout, and suspension before their second. A natural welterweight, this is a move up in class, but not in skill. In September of 2017, after much posturing from both sides, GGG and Canelo finally met in what was supposed to be a modern clash of the titans. In terms of actual action, the fight delivered and was entertaining, until the scorecards spoiled the evening. 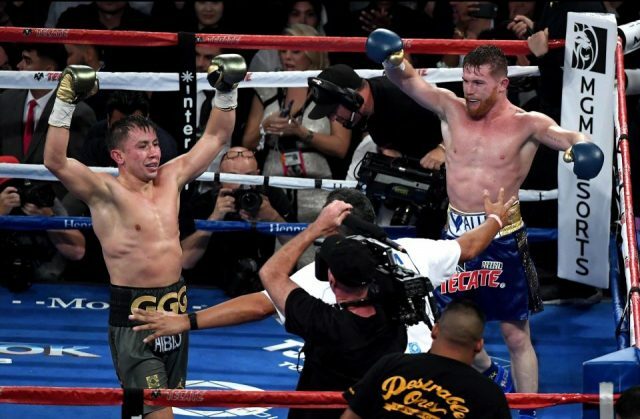 Most viewers felt that Golovkin had done enough to control the action with his active aggression to have the bout scored in his favor, with Canelo providing a worthy opponent who lost by a small margin. To have a card score an eight-point victory, and another an outright draw really took a lot of energy out of the room, leading to a disruptive crowd for the duration of the post fight interviews, in which both claimed a rematch would be necessary. This fight should have happened regardless of the largely manufactured draw. Scoring can be complicated but Golovkin v. Canelo I was not. It felt more like ring theatre than boxing. People want to watch good fights. Their first bout had 1.3 million buys. The number should be close to the same, as those interested will be in for another go around, while the bad press over the poor scoring won’t help bring viewers in. It offers another thing to hold against the struggling sport. There will not be another write “obituary” for boxing or telling of “the last great fight” on the website because it isn’t. There will be others. There’s always a next star, and plenty of money to keep the sport afloat. Signature events need less buildup and more frequency. Canelo did move up in weight for the fight, but so hasn’t ever great champion outside of the heavyweight division, for they had nowhere to go. By 2015, both of these fighters were full on bonafide stars. Canelo opted to take on James Kirkland, an aging Miguel Cotto, Amir Khan (who moved up to take him on), Liam Smith, and the underachieving Julio Cesar Chavez Jr. before agreeing to the Golovkin bout. Much like the sport that it dominated the American Sportscape alongside in the 1950s, horse racing, share many traits these days. People really get up and excited for the Triple Crown races. People really get up and excited for a fight that has the boxing world’s eyes, drawing in casual fans with name recognition. Things now in both games are built around the thoroughbreds. Both Golovkin and Alvarez are, and we need them to be running in the same race for the fight game to be the best product it can be. It always felt to me that it was Canelo who held up the first bout. Coming off a suspension won’t be easy for the mega talent, but he provides a solid challenge to Golovkin to make this fairly interesting. Expect more of the same from the first bout. Gennady will force the issue, Canelo will counter as best he can. If you want to see a knockout, you better hope for one in the undercards because barring some sort of massive error, both fighters are too talented to get caught the way that some of their lesser competition has. Gennady Golovkin, by unanimous decision.